Here at Kosmos Hair salon in sunny Jupiter we always try to stay ahead of the game, offering the latest in trends, products and technology. So when we received the new Babyliss MiraCurl, we were all very eager to try it out. 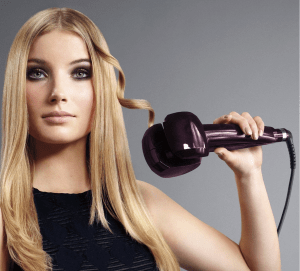 It literally pulls the hair into a motorized chamber relieving the user from twisting, clamping or twirling like most curling irons. Bonus? It has a timer feature so you don’t have to guess when your curls are done heating up! The idea is groundbreaking, offering the user the flexibility to control every aspect of the look without all of the work. And being that we live in South Florida, who wouldn’t want to have perfect curls or beachy waves without all of the normal time and effort involved? The Miracurl is the world’s first fully automatic professional curl machine. You can control the temperature, setting time, and curl direction with a click of a button. The Babyliss Miracurl provides flexibility to form loose waves, soft swirls and defined curls with different curl patterns and tightness. It was built with the max life pro brushless motor, which provides precision curl control. Hair is gently inserted and pulled into the nano titanium curl chamber, where its is held and heated for foolproof curls. It also features a smart tech safeguard, which is a 3 in 1 energy saver that has a auto shut off, sleep mode, and a motion sensor. Each section is evenly heated up to 450 degrees for either 8 seconds, 10 seconds, or 12 seconds depending on hair texture and desired effect. It will signal when to release the curl after the preset timer goes off, ensuring the integrity of the hair is protected, and each curl is consistent. Once you figure out which settings will work for the look you are going for, the rest is pretty simple. It does take some figuring out, but its not too difficult. The only downside we found with this product is that it’s not really for girls with silky fine hair. If this is your hair type, be sure to spray plenty of hairspray on the hair before inserting it into the chamber, or the curl won’t take. So if you don’t like a lot of hair product and your hair is fine, this system isn’t for you. It definitely works best for normal to coarser hair. If you are unsure if it will work for you, you can always schedule an appointment at Kosmos Hair salon and we would be happy to use it on you and show you how it works! Happy Curling!